Joined 8 years ago from U.S.A.
Michael has been perfecting his crafts for over 30 years now. Starting in the mid 1970's with his jewelry which could be found in gallery's around America, continuing as a featured leather artist for the Smokey Mountain Arts and Crafts community at the 1982 World Fair. His woodwork also can be found around the country in which he uses reclaimed lumber, found and discarded items to make many of his pieces. Continuing expanding his talents he now adds custom Hand Drums of all kinds to his portfolio. 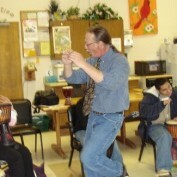 In 2001 he formed Drumming for Peace a non profit that works to spread the joy of hand drumming and group drum circles. He uses the sales of his artwork to support this effort.